Ah oysters — the food of love. Oysters have been worshiped by food enthusiasts throughout history. The Greeks served them with wine and the Romans so thoroughly adored oysters that they sent thousands of slaves to the shores of the English Channel to harvest them. Every oyster has its own unique flavor profile. Salty, sweet, some having undertones of cucumber, fresh melon, copper — all of these factors are dependent upon the waters in which they thrive. 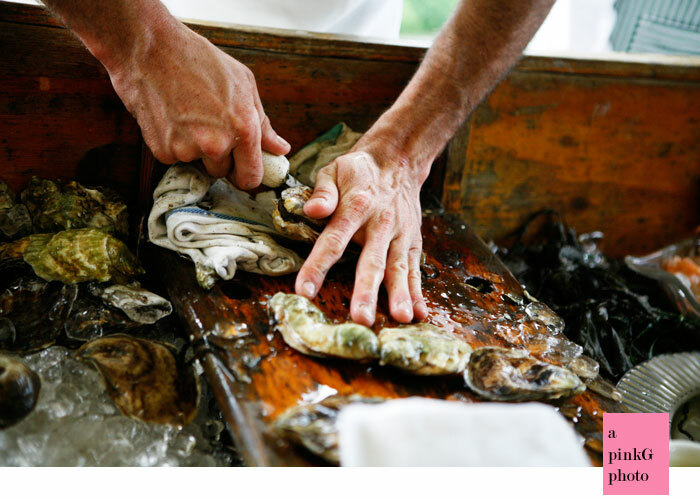 A little hip tip for an event — have a member of the catering team be on hand to serve and discuss which oysters the guests are eating. A little lesson never hurt anyone. Oyster purists will say that one only needs a squeeze of lemon or a dash of mignonette (a wonderfully appealing sauce made of wine, vinegar, and shallots…delicious), but do not be afraid or embarrassed to offer cocktail sauce, since it could be a way to get a novice to try them. The best choice to serve at an event is either Malpeque or Caraquet. These are always uniform in size and go down easier than most. Malpeques from Prince Edward Island possess a perfect balance of sweetness and brine. Caraquets from New Brunswick are smaller and extremely mild-tasting, with just a hint of brine. Perfect for that unsure guest. Kumamoto Oysters are another treat. They have a slightly fruity flavor, with a mineral finish and a buttery texture. Another thoughtful choice for the oyster novice: serve them with a ponzu granita and a spoonful of tobiko for an elegantly presented version of oysters on the half shell. The crunch of the tobiko and the sweet hint of ponzu make for a wonderfully rich experience. Scared of having briny liquid drip on your guests? How about an oyster shooter? Place a raw oyster in a shot glass, add a little cocktail sauce, extra horseradish of course, and then pour in some chilled vodka. Take it even one step further and use infused vodka, such as jalapeño or even dill. If choosing to serve oysters, be sure to have a good choice of white wine to pair with them. Many dry, acidic whites work quite well with oysters. An unoaked Californian Chardonnay or many of the Sauvignon Blancs from New Zealand or South Africa work, and are very friendly wines to buy in bulk and serve at an event. But really, since each oyster has such a different taste, you can pair with anything most days. A half dozen oysters on the half shell washed down with an icy cold beer…well, that works just as well. Eat responsibly; after all, they are an aphrodisiac. So, best to limit the consumption at an event or make sure you are eating in good company, because you never know what could happen. Take this note from Cassanova’s Volume Six: ”I placed the shell on the edge of her lips and after a good deal of laughing, she sucked in the oyster, which she held between her lips. I instantly recovered it by placing my lips on hers.” Catch the drift? my first was in New Orleans!